#HealtheVoices15: We are not alone. April 17 through April 19, I attended the HealtheVoices Conference in Jersey City, New Jersey. Janssen Pharmaceuticals paid for my train travel, hotel, and meals so I could take part in this gathering. 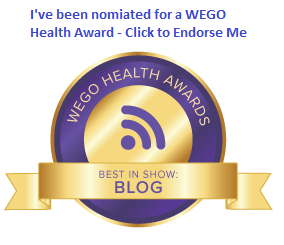 In case you’re wondering, all opinions expressed here, or using the #HealtheVoices15 hashtag are entirely my own. 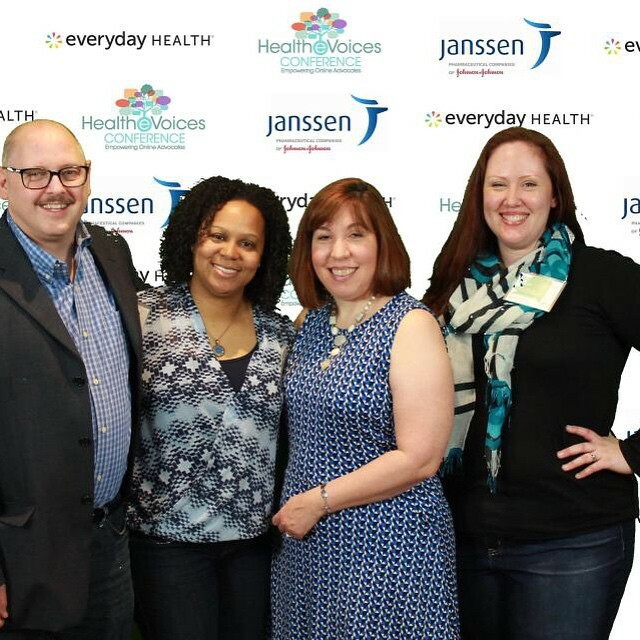 I spent last weekend at something called the HealtheVoices conference in Jersey City. Unlike all of the diabetes conferences I’ve attended in the past three years, this conference brought in people living with a host of different chronic conditions. And you know what? I discovered we are not alone. Okay… sure… I knew that People With Diabetes are not the only ones living with a chronic condition. But when you get immersed in a cause, after a while, you tend to forget about the others who are out there working on different causes, lifting up others living with a different disease. One of the really cool things about this weekend was the opportunity to see and hear from people living with and advocating for those living with Chron’s disease, HIV, Rheumatoid Arthritis, Cardiovascular issues, Breast Cancer, Prostate Cancer, and so much more. The presentations were well thought out and well presented. I liked learning how people are making a mark in their own patient communities. There were also presentations where we learned about the legal ins and outs of writing a blog, how to take an idea and get it funded, and the importance of telling our stories online and engaging with others to create a better community. And just like the diabetes conferences, there was real value in the one-to-one, peer-to-peer conversations that happened over breakfast, lunch, dinner, and between sessions. Some of the best ideas I heard, and some of the most inspiring things I witnessed, came in those quiet moments where someone was able to share what they’ve experienced and what they’ve learned with a bigger audience. I got to watch groups from other conditions gather and share and laugh together, just like PWDs do. I found that the power of “me too” isn’t exclusive to diabetes. So by now, you may be asking: What about the diabetes people in attendance? Well, let me tell you… the diabetes team absolutely rocked it this weekend. Cherise, Karen, Kim, and also Christel and Kerri (who also presented and was on the advisory panel for this conference) were sponges who spent equal time gathering information, listening to others, and sharing their stories and tips with others. They were tweeting like crazy and asking questions and engaging in conversation. One of the other things I learned about this weekend is that we’ve accomplished an awful lot all on our own. I should also take a moment to thank the people at Janssen who gave up their weekend for this event. Thanks especially to Rachel Yurchak and Caroline Pavis, and to the people whose last names I don’t remember, like Stephanie and Beth. You made us all feel welcomed and important. I’d like to think I’ve met a few people that I’m proud to say are friends now. I’d also like to think that I’ve found a few new things to aid me in my advocacy efforts. Listen… My diabetes community bubble is good. It helps me when I’m down, it inspires me to perform advocacy, it has changed my life in a positive way forever. The great thing about the HealtheVoices Conference was that I could see, and learn from, additional communities that are doing the same thing, with people who are just as inspiring, and who encourage me to do better and be better. I will never forget their stories. Sounds like fun. Of course, I do have to wonder: What does Janssen hope to get from this and plan to do as a result? Seems like this is a continuing conversation that so many have had, from Sanofi and its PIPH gathering to others that have all come to the same conclusion: peer support is good, online connections are good, the me, too, and “we are not alone.” Yep, all truths. But what’s next? Mike, that’s a great question. I do know that I shared brief “first year” comments with Janssen people in the hope that this would be continuous. I can also share that the sessions themselves included topics related to personal experiences, personal successes, and personal things we as patient advocates deal with. From the Janssen perspective, what was relayed to me was “We want to encourage you to share with us and each other. Ask questions if you have them, or tell is if you’re not comfortable.” Not anything I can remember in addition to that right now. Thanks! How wonderful that your eyes reopened to other chronic illness communities. There are many aspects of OUR community that cross disease-specific boundaries and when we connect over those issues our voice (as people with chronic illness) gains momentum. While attending Med X last year, I had the same experience. You wrote about it so eloquently. Thank you. Thanks Heather… I owe you some comments on your MA project. And, Mike and Heather: I have some “what now?” things I want to work on, but I obviously need to be able to make them happen before I can say they are successful. Thanks for sharing some of your experiences at the conference, Stephen. totally agree with Heather (Thx for that great comment!). And btw, in case I did t e press it above: THANK YOU for being a part of this, and for sharing this with all the rest of us. So very much appreciated. What a great recap, Stephen. I’m so glad you were in attendance! !